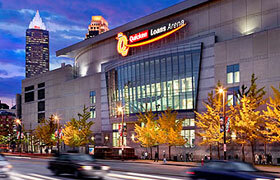 The Quickens Loans Arena, better known as "The Q" plays host to a number of events in the Cleveland Area. In the month of June, The Q featured had multiple listings such as Taylor Swift concert, World Wrestling Entertainment (WWE) Monday Night Raw, Cleveland Gladiators Arena Football League, National Basketball Association Eastern Conference Finals Cleveland Cavaliers, and comedian Kevin Hart's world tour of "What Now?". Click Images below for further details!!! Mr. Mike Ostrowski is the Executive COO and Senior VP of Franchise Operations for the Cavaliers Operating Company, LLC. He began working for the Cavaliers Operating Company as an Outside Sales Representative in 1999. Since being promoted as an executive, Mr. Ostrowski has witnessed his Cleveland Gladiators earn the best record in AFL history of 17-1 raising the banner as American Conference Champions!